Description: This plan shows the barracks along Knightsbridge erected for the Horse Guard at the end of the 18th century. The title appears at lower left, below the scale bar. 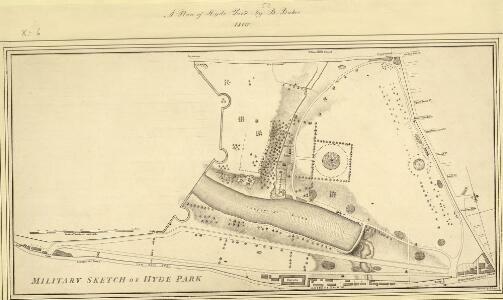 At over 340 acres the largest of the royal parks, Hyde Park was originally a hunting ground for deer, boars and wild bull. Bequeathed to the monks of Westminster after the conquest of Geoffrey de Mandeville in the 1140s, the park was appropriated by Henry VIII at the dissolution of the monasteries in 1536. The park was opened to e public at the beginning of the 17th century and remained a deer-hunting ground until 1768.